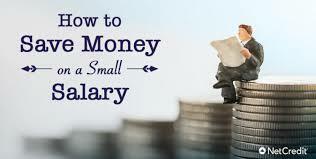 How to save money from your salary is the biggest worry for a common man. There are so much expenses now a days that saving money looks like impossible. But if we set some rules and change in style of expenses, we can easily do some savings each month. There are some rules and habits to follow to save money every month. One should always distinguish between need and want. We simply more spend on our wants than needs. For example Ramesh wants to buy a new smartphone while he is having a phone which is also running and working good. We can post pone these expenses as much as we can. Remember the wants are unlimited and we can’t compromise with the need for paying for wants. Simple formula of saving is to post pone your wants but never post pone saving plan. If you invest anywhere like in recurring deposit for a small amount every month, don’t let stop it and try to pay the installment on time. One should have an investment habit and try to invest every month instead of lump-sum. Investing small amount every month will be a good amount in year and it will surely increase your savings. There are many plans in investing like SIP which gives good return compare to FDs. Investing every month can write off adverse effect of inflation with the interest you earn. One must have financial goals as it will help in investing more and spending less. For example, if you want to purchase a new car in next 3 years, your financial goal is to cover as much as amount with your saving so you will not need to take a loan for your car and pay interest on the loan and save yourself from EMI. For Example you want to purchase a house of Rs. 20 Lakh in next 5 years, you should consider the amount will be 30 lakh in next 5 years for home and start investing accordingly. Saving money at home is not a good habit. It will decrease money value due to inflation. One must invest saving money to get interest on your saving. However, emergency funds should be kept at home. Don’t spend big on sale and discount offers Sale and discount offers are normal things in market now a days. You can get discount 7 months out of 12. So don’t madly spent on sale and purchase only things of use. Like people purchase woolen cloths in summer just for sale offers. Fashion changes every day. One must behave rationally in spending. Expenses on fun One must enjoy his/her life and fun, roaming, enjoying life is good. But one should set a limit of expenses for it. Sometimes we can save money by cooking a dish at home while cost hundreds at market. Save where you can Every month review your expenses and make a chart where you could save money in it. This will give a better picture and implement on next month. It works.